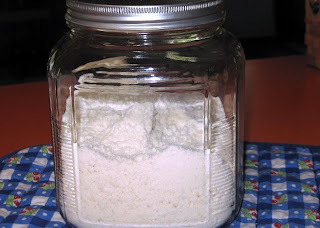 I found a recipe, recently, that I really wanted to try, however, it called for 1 cup of commercial Bisquick, an item I don't usually stock in my pantry. I wasn't too keen on buying a whole box of Bisquick (when I only needed a cup of it) so I went Internet surfing for a Bisquick clone recipe. I found several but they all called for shortening (not exactly what I was looking for). Then I found the following recipe, which uses Canola oil (on http://www.food.com/ ) I used it to make biscuits for dinner tonight and we were VERY pleased with the light, flaky results. They were very similar to commercial Bisquick biscuits (picky-picky husband said the were much better than Bisquick) and you can NOT beat the convenience!! I intend to keep a canister of this mix in my pantry from now on. This recipe can easily be doubled or tripled and I love that the ingredients are always on hand. Whisk everything together (I used my stand mixer with the whisk attachment) but a hand whisk would work just as well, it will look like this. Store this mixture in a container with a tight fitting lid (at room temperature) for up to 6 weeks. Use it exactly like you would for ANY recipe that calls for Bisquick (biscuits, muffins, pancakes, pot pie crusts, etc.). It not only saves a lot of money, but it tastes great too!! Mix with a spoon until it comes together, then turn out onto your counter that has been dusted with a little more of the dry mix (don't use flour). Knead lightly 10 times, then pat to 1/2" thick. Cut with 2½" biscuit cutter. Place on greased cookie sheet (I use parchment) and brush with melted butter. The melted butter is optional, but we like them that way. Bake at 450 for 10-12 minutes (my electric oven took 12 minutes). Colleen, I am making these for tonight's dinner. 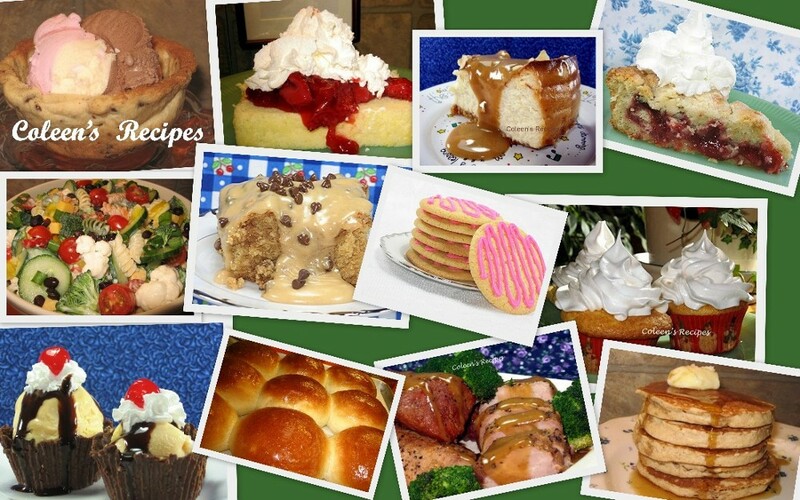 Here in Hopkinton, Mass it is a cool day and with rain showers, so I am baking woopie pies and frosting and then I am making the biscut nad putting in my glass sealed jar and then making some tonight. You always have great ideas. Oh wow..this is the first time a clone recipe doesnt call for shortening. I will be making this for sure! My daughter loves Bisquick pancakes. I'll have to give this a try. I used to make a Quick Mix that was similar to this. It is handy to have around. Thanks for reminding me of this. What a great recipe to have on hand! I love homemade versions of store bought products like this. So much better for you! I'm liking this clone biscuit! 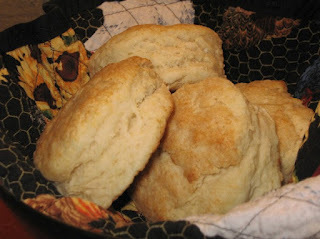 I don't usually keep bisquick on hand either - this is a great recipe to have! I've often seen recipes with bisquick I wanted to make too. Nice! I love cheating the system with make-at-home Bisquick - great idea! 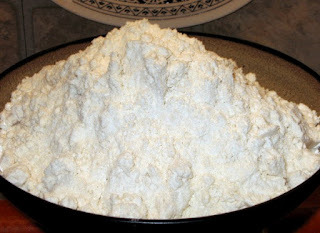 You will find that if you freeze the flour (about a week)you never have to worry about bugs getting into your mix.